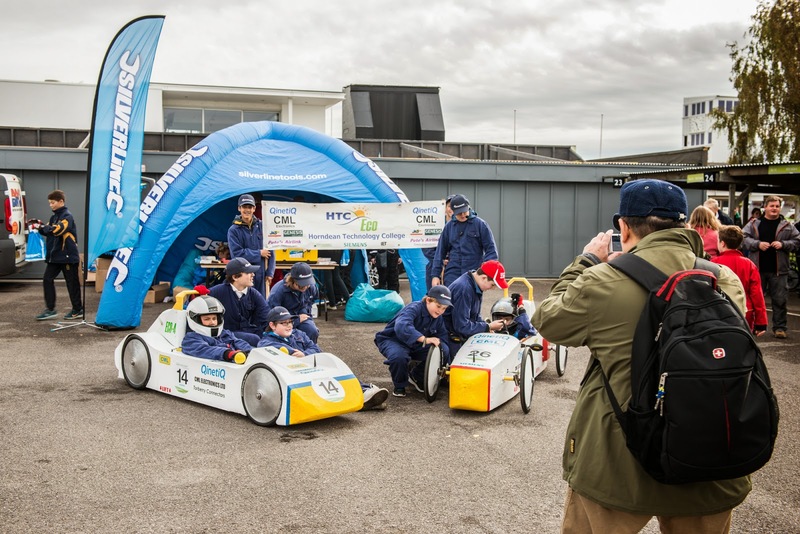 The Greenpower Education Trust International finals at Goodwood Motor Circuit last Sunday was a perfect way to round off a successful season of racing throughout the UK. After 13 regional heats for the IET Formula 24 teams and 8 championship rounds for IET Formula 24+, a total of 79 cars lined up for the younger age group challenge and 26 were on the grid for a competitive senior challenge! As well as a number of cars competing on the track, the event also featured an engineering and careers exhibition. Some of the low carbon vehicles on display included the McLaren P1 supercar, a Hybrid Range Rover and the Nissan Leaf Nismo RC. Silverline was situated in Paddock 1 with a host of teams including those entered into the Silverline Corporate Challenge. We arrived early on Sunday morning to set up our workstation, offering tools for any repairs teams may require throughout the day! We took a range of tools from hex keys to tyre inflators and pliers. As well as our fully equipped workstation, we gave away hundreds of goodie bags and soon there was a sea of blue hats amongst competitors and spectators! Back on the track, after Race 1 (the first fully International race including teams from the US and South Africa), it was time for the Silverline Corporate Challenge. The Corporate Challenge is a fantastic opportunity for businesses to demonstrate their engineering expertise against a number of other corporate and academic teams. The technical regulations are the same as for the IET Formula 24+ so each team has one pair of batteries to use during the 60 minute race! We spent the weeks leading up to the Finals filming a selection of teams entered into the Silverline Corporate Challenge, including MIRA Greenpower, Renishaw and Jaguar Land Rover. It was awesome to follow their journey as they built and prepared their cars from scratch ready to compete in the final. We were particularly impressed with Renishaw’s set-up at their New Mills headquarters in Wotton-Under-edge. The cutting edge technology and engineering on display is seriously impressive and it’s clear to see how they went on to win the 2014 Silverline Corporate Challenge! As well as participating in the Corporate Challenge, Renishaw has been one of Greenpower’s long term industry sponsors, supporting the Western Region Castle Combe Heat for many years, as well as housing the IET Formula Goblin event in the car park of the New Mills headquarters! 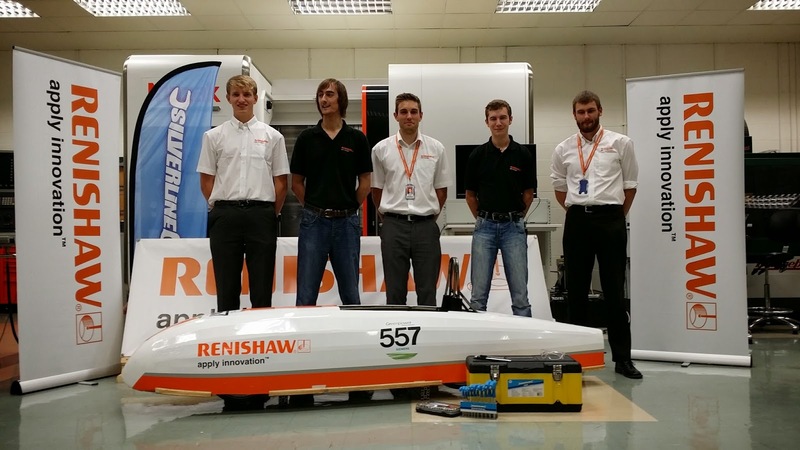 The team's first priority was to radically update the existing Renishaw Car, Probation IV, and the expertise of the former team members was immediately obvious with the car performing much better than previous incarnations. They also undertook a new build, based on the existing car but lightened and slimmed down. This new car, Reprobation, has shown that the team now really mean business, and with a win and two second places in the IET Formula 24+ Championship they took second place overall, finishing behind the exceptional Cullimore Racing's Jet. Reprobation also picked up the Silverline Corporate Challenge crown, beating off Jaguar Land Rover, MIRA and the previously indomitable Silesean team from Poland. Silverline is proud to have supported Greenpower throughout 2014 and especially the Silverline Corporate Challenge. A huge well done to all teams involved and we’re already looking forward to seeing more impressive engineering in the 2015 race season!